Rockwell & Rockwell Superficial tests consists of forcing an indentor (Diamond or Ball) into the surface of a test piece in two steps i.e. first with preliminary test force and thereafter with additional test force and then measuring depth of indentation after removal of additional test force (Remaining preliminary test force active) for measurement of hardness value. 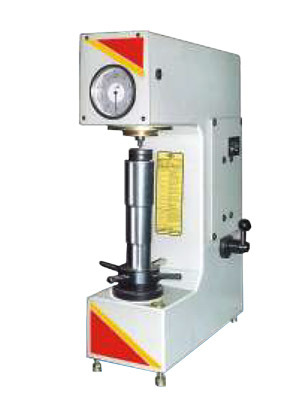 Brinell test consists of forcing a hardened ball into surface of a test piece with a specified test-force and measuring the diameter of indentation for evaluation of Brinell hardness number. In case of 'RASN' series machines for Rockwell & Rockwell superficial tests a preliminary test force in first applied and then indicator is automatically set for zero. Quickly thereafter an additional test force is applied without removing the preliminary test force. 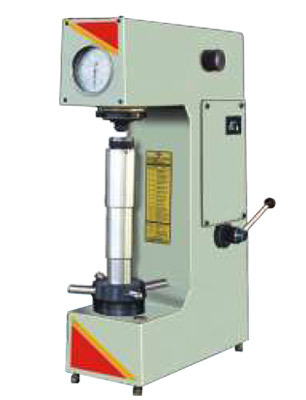 When the penetration is stabilised, the additional test force is removed and the hardness number is shown directly on the indicator. The operation is exactly same as above. However, the diameter of impression is measured outside of machine by Brinell microscope. Brinell hardness number is found out by referring corresponding hardness tables showing hardness number against dia. of indentation for specified ball diameter and test force. Preliminary Test Force - 98.07 N (10kgf). Additional Test Force - 490.3, 882.6, 1373N (50.90, 140 kgf). Total Test Force - 588.4, 980.7, 1471N (60, 100, 150 kgf). Test Force Selection by external dialing. Auto zero setting dial gauge. Suitable for Rockwell & Rockwell Superficial Tests. Preliminary Test Force - 29.42, 98.07N (3, 10kgf). Additional Test Force - 177.7, 264.8, 411.9, 490.3, 882.6, 1373N (12, 27, 42, 50, 90 & 140 kgf). Total Test Force - 147.1, 294.2, 441.3, 588.4, 980.7, 1471N (15, 30, 45, 60,100,150 kgf). Motorised for automatic Operation cycle i.e. load/dwell/unload. Preliminary Test Force - 98.07N (10kgf). Additional Test Force - 490.3, 882.6, 1373N (50, 90, 140 kgf). 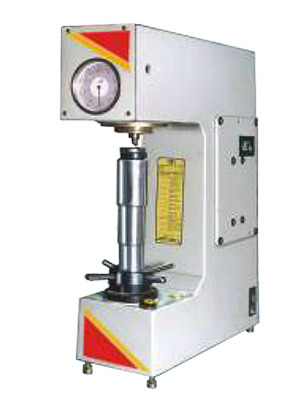 'FIE' new 'RASN' series of Hardness Testing Machines come with much improved design and look with following major design changes. 1) The machine body is having a taper front look and a big size dial gauge in the front. The machine is powder coated for far better look. The paint shade do not fade and machine looks like new over year. 2) The elevating screw of machine is guided in a hardened and ground bush, not allowing movement of elevating screw more than 0.05 mm when raised to full height. The accessory is returned for years together due to hardened bush. 3) A hardened and ground stepped bush is fixed on top of main screw for location and rest surface. This guarantees no change in results due to rough handling of test table or test piece. It means a trouble free long life machine accuracy. 4) An antifriction linear bearing with almost no clearance is provided for a perfect vertical movement of loading plunger with minimum friction. This enable testing of small dia. pin or ball upto 3 mm dia. 5) All machine models are provided with automatic zero setting dial gauge or digital readout. Hence zero setting at every test is avoided. 6) All four models confirm to respective standard as under. IS : 3804, BS 10109-2 & ASTM E-18 for Rockwell Test. IS : 5073, BS 10189-2 & ASTM E-18 for Rockwell Superficial Test. IS : 2281, BS 10003-2 & ASTM E-10 for Brinell Test. Testing Table 38mm dia. with 'V' groove for round jobs 6-45 mm dia. Steel Ball Indentor 1/8", 1/4", 1/2"
Testing Table 70mm dia. with 'V' groove for round jobs 10 to 80mm dia. Vari-rest to support odd shaped jobs. Jominy test fixture for end quench test. Raised centre testing table 15mm dia. Cylindron anvil for testing big jobs above 20mm dia. Jack rest for long and heavy jobs.